Basic 8-ball strategy can be broken into eight simple rules that you must follow if you expect to be successful. Rule 1: The first thing you need is a good, strong power break. The goals of the break are to scatter the balls, pocket one or more ball, and move the cue ball toward the center of the table. Now, winning a game doesn't rely wholly on meeting these three goals, but you will usually have an easier time running a rack if you meet one or more of them. To develop a strong power break, try different ways to position your grip and vary grip pressure. Also, make sure that when you strike the cue ball, you are hitting it as close to center as possible. Rule 2: Choose wisely between stripes and solids. To do this, you must very carefully inspect the layout after the break and select the balls that have clear paths to the pockets. When choosing on an open table, you may have to hit a stripe to make a solid or vice versa, so it is a good idea to stay open-minded during this step. Rule 3: In your mind. 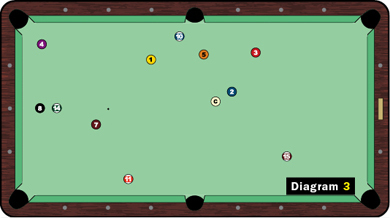 Create a strategy that maps out exactly how you want to run all of your object balls and the 8 ball. You should never even attempt to take your first shot until you have the entire rack run successfully in your mind. Rule 4: When choosing the route in Rule 3, you need to minimize cue-ball movement as much as possible. The less you have to move the cue ball, the fewer chances there are to lose control of it. 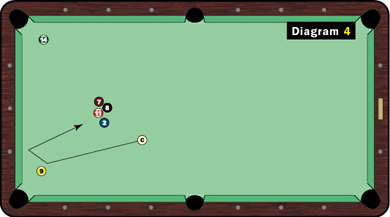 Stopping the cue ball will always allow you to know exactly where you will be next, so find patterns that allow you to stop the cue ball as much as possible. The situation in Diagram 3 might not come up in your next match, but it's a good teaching tool to find the easiest way out. Look at how the solids are positioned. You can run all six of them and the 8 ball using only stop shots. The route: 5, 3, 2, 1, 7, 4, 8. Now do you see it? Rule 5: Keep all of your shots as simple as possible. Be a realist; choose a route that involves high percentage shots with respect to your playing ability. It is best if you don't try to get fancy with kick shots, banks, combinations, etc., if it is at all possible to avoid such shots. Rule 6: Never make guesses as to where the cue ball will end up after a shot. Be as precise as possible when picking a point for position for each shot. If you followed Rule 4, and chose shots which minimize cue-ball movement, it will be much easier to follow this rule. Rule 7: Unless absolutely necessary, do not let the cue ball run into other balls. Contact with other balls can create surprise movements and situations, which in turn will cause problems for you when you try to follow the original strategy you created in Rule 3. There are a few other keys to success. Before every shot, walk over and inspect the spot where the cue ball will end up to make sure you are satisfied with what the next shot looks like. Furthermore, if you make a mistake during your run, be prepared to stop, reexamine the remaining layout, and choose another route for the remaining balls. If you always look at all of your options on every shot, you will inevitably be able to select the optimal path.